Need optimized Medical coding outsourcing services? ICD-10 woes impacting your claims submission process? Looking for HIPAA compliant Medical Coding Billing services? It is true that having a synchronized medical coding practice is the cornerstone to billing priorities. The advent of ICD-10 has made diagnosis coding more specific that needs careful adherence by the coders. Also, there are regular updates in terminologies & a modern coder needs to have a 3600 perspective that will improve consistency in your claims. Sunknowledge Services Inc. is your one stop destination for all coding needs. Over the last 7 years we have helped providers with our refined solutions in medical coding services. 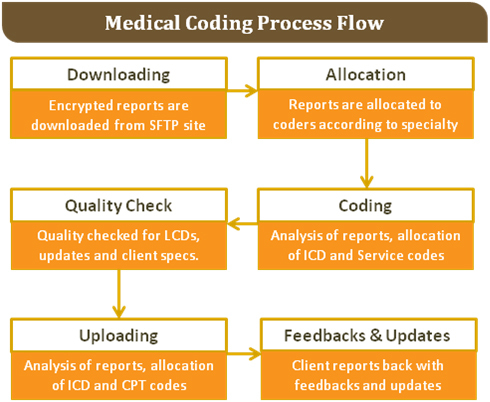 We have an extensive pool of remote medical coder who will demystify your medical coding billing services. Your Perfect Outsourcing Medical Coding Services Partner! Sunknowledge guarantees a sensible approach in coding & helps you achieve the needed transparency. We will evaluate your existing practices & implement our extensive skill-set that will revamp your coding process. Fraud & abuse of information is one of the worrying factors today in the healthcare industry. Careful adherence to quality & elimination of malpractices like up coding & down coding is a necessity if you want to achieve financial growth with your practice in the long run. Our team of experts will handle your procedural & diagnosis coding practices in a seamless manner. As a disciplined vendor, we look to address your medical coding outsourcing needs in a consultative manner helping you focus on your core competencies. We are a specialized company in DME billing & our HCPCS process is holistic addressing all your lab & equipment services. We also have standardized processes in place with CPT that helps you gain a qualitative edge with your physician services with our distinct methodology. Let us accelerate your Medical Coding! We look to partner with you with our exclusive medical coding services. Get in touch with us by filling out the form & we will get back to you with our models of engagement.